Dear Pious Petunia: People in my school spend upwards of $500 on prom night for the dress, the hair appointment, the manicure, the dinner, the dance, the limo, and—for some—the hotel room and the booze. A senior boy asked me to go this year, but my parents didn’t let me “because it’s not what Christians do.” I’m almost glad, because I didn’t like the boy much. But next year, I’ll be a senior. Should I try to convince my parents to let me go? Will I always regret it if I don’t? Miss P: It seems more likely you will regret it if you do, especially at those prices. But let’s work the problem. No one can explain American prom night traditions. Is prom a memory of some ancient, Dionysian mating ritual? A modern exercise in celebrity-induced vanity? It’s a puzzle, since prom traditions seem designed specifically to torment teenagers. What better mechanism could be devised to cut into the wounds of youth—the social status anxieties, body issues, class insecurities, gender identity struggles, and tendencies of young brains to make very bad decisions? Yet Americans find these traditions weirdly irresistible. Schools perpetuate them as if the Common Core required it. Teen-oriented movie plots inevitably culminate in some prom-related scenario. What, for crying out loud, is the big deal? I’m afraid we will have to leave these mysteries unpondered and skip to your practical dilemma: to go or not to go. Miss P believes that it’s largely up to you, dear. If you want to go next year, then come up with a plan to do so in a decently Christian way and present this plan to your parents. This will probably involve a dress that covers your territories, a date with pure intentions, a solemn pledge to eschew any abusable substances, a modest budget, and a civilized curfew. You will impress mum and dad with your maturity. They might say yes. Perhaps you could try a hipster prom. Everyone stops first at the thrift store to suit up, then goes off to the fair trade coffee shop/vegan restaurant. Dancing takes place outdoors in the park, barefoot, with someone’s phone and a bluetooth speaker providing the tunes. For hard-core partiers, the night ends with a single, illicit craft beer. Total budget: $25-30, $8 of which is for the beer. Or, if you want to claim the moral high ground, you could get a group together and spend the evening serving soup at a homeless shelter. Dress in grubbies, dance with the clients, contribute $50 each to the shelter, and spend Monday back at school looking smugly down upon all the formerly sparkly, now exhausted and regretful prom-goers. “Ugh, they’re so ‘mainstream,’” you may declare about your peers—“so coopted by the prom industrial complex.” You will have earned a brief indulgence in a sense of superiority. Dear Pious Petunia: My parents insist on throwing a big party for my college graduation. I don’t really want a party, but I know they’re proud and want to be nice, so I’ll smile and put up with it. But how can I politely convey to all the guests that I don’t want any gifts—just cash? Miss P: Well, if your guests have any sense, they will know that already. But I understand you’re in a spot here. Inevitably there will be guests who believe they are being extra thoughtful by wrapping up a copy of that tiresome Dr. Seuss book or yet another niche devotional. Usually they mean well. On the other hand, they may have found these items around the house when their own graduate moved out a couple years ago and sensibly left these items behind, their bindings uncracked. However, have you considered the possibility that your parents are already gently hinting that guests might limit themselves to cash gifts? Perhaps your parents are savvier than you know, and this party is a cake-and-punch-enhanced attempt to gain a little assistance from loved ones in subsidizing that prolonged adolescence researchers predict you are only about half way through. Dear Pious Petunia: My college has just instituted a rule about mortarboards on graduation day. We are not allowed to decorate them anymore! They say it’s a matter of “dignity.” Isn’t this a violation of our First Amendment Rights? Miss P: Oh dear. Where did you say you went to college? Why is it that you still have no idea over which matters the First Amendment does and does not have jurisdiction? Goodness: go look it up. Enough scolding. Miss P agrees with you. Your college’s administration is overly fastidious on this one. After all, graduations can be discouragingly dreary affairs. Excited graduates and relieved family members compelled by tradition to sit for an hour or two on uncomfortable bleachers or folding chairs while a parade of speakers drone on, dispensing generic advice and bland bromides—we all know the drill. However sincere and lovely the ceremony may be, it’s a long exercise in patience and suppression of high spirits. So why not have something to look at besides the program? I think it’s delightful that students decorate their mortarboards. I’ve seen pre-med students with model hearts atop their heads, engineers with little igloos, English majors with Shakespeare quotes, and all manner of clever sayings and bedazzlements. As long as nothing is grossly obscuring the view of people behind or actively squawking, what’s the harm? There’s altogether too much dignity at graduations already. 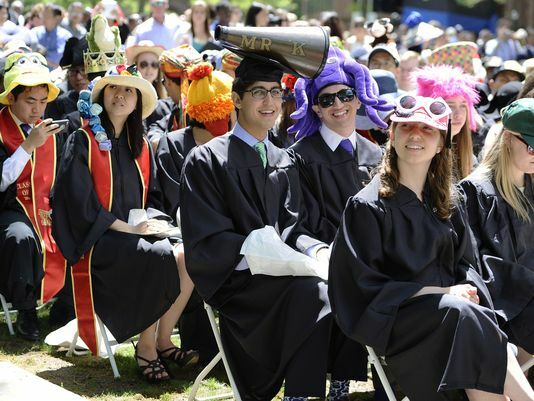 Besides, faculty are wearing silly hats in the form of fancified mortarboards. Why shouldn’t graduates? Miss P: Well, you are in deep there, friend. Miss P loves her country and enjoys a little patriotic fervor on appropriate occasions. But the patriotism police should not be allowed to run the church. Let’s put this in perspective. The church has its own calendar, and the Sunday before Memorial Day usually falls just before or after Pentecost. That’s what should be going on in church that Sunday: praise to the Holy Spirit and teaching on the Spirit’s work. Meanwhile, did you know that Memorial Day wasn’t even established as an official federal holiday until 1971? The spring tradition of decorating soldiers’ graves began just after the Civil War, which tells us that the origin of this holiday was a sort of collective “What have we done? !” response to our nation’s bloodiest and most divisive crisis of conscience. So there’s no need for the foot-stampers to act as if the church has been staging patriotic extravaganzas since ancient times. Not the case at all. ignore the federal holiday calendar altogether and stick stubbornly to liturgical purity. So what should you do in your present pickle? Alas, you have little room for lateral movement here. As an intern, you have only the dimmest perception of this particular church’s politics, which, no doubt, run deeper than tap roots. You could, I suppose, take a stand, plan a totally different service, and invite the pastor to blame you for everything. But then, when you go merrily on your way after your internship, nothing will change at the church. Miss P suggests, instead, that you start small: lobby diplomatically to insert a hymn of conscience into the service, and bring your vegan brats to the cookout. Actually, that roast pig may be the one savvy strategy in your pastor’s proposal. Churches are usually poorly attended this weekend, but the smell of roasting pig flesh might bring a few more worshipers into the presence of the Lord.